Early detection of HIV infection is the best way to prevent spread of the disease and to improve the efficiency of the antiretroviral therapy. Nucleic acid amplification tests (NAAT) have become the gold-standard for detecting low-concentrations of the virus in blood. However, these methods are technically demanding and cost-prohibitive in developing countries. Immunoassays are more affordable and can be more easily adapted for point-of-care diagnosis. However, the sensitivity so far of these methods has been too low. 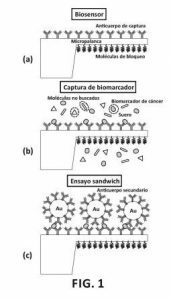 The research, published on February 15th in the journal PLOS ONE, reports the development of a sandwich immunoassay that combines nanomechanical and optoplasmonic transduction methods for detecting the HIV-1 capsid antigen p24 in human serum. 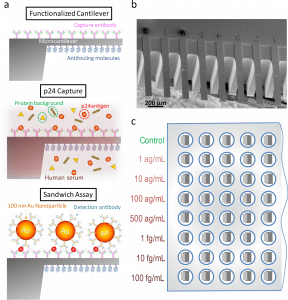 The immunoreactions take place on the surface of a compliant microcantilever where gold nanoparticles are used as both mechanical and plasmonic labels. The microcantilever acts as both a mechanical resonator and an optical cavity for the transduction of the mechanical and plasmonic signals. The limit of detection of the immunoassay is 10−17 g/mL that is equivalent to one virion in 10 mL of plasma. This is 5 orders of magnitude better than last generation of approved immunoassays and 2 orders of magnitude better than NAAT. 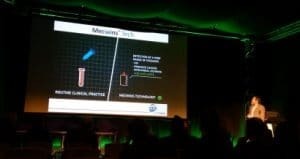 This technology meets the demands to be produced en masse at low cost and the capability for miniaturization to be used at the point-of-care. Schematic representation of the p24 sandwich immunoassay. You can access to the publication in PLOS ONE journal by clicking here. Our general director, Dr. Oscar Ahumada and business development manager, Rosalía Calleja have visited India again for a number of commercial actions. They held an update meeting with the local representative Dr. Anand Dixit (Fourvac). Additionally they took the chance to follow up previous conversations with Solid State Physics Laboratory (SSPL) in Delhi or IIT-Kharagpur. They took also the chance to visit the Central Manufacturing Technology Institute (CMTI) located in Bangalore and give a talk to introduce our latest innovations to the audience.